Happy Thursday! I know this should have gone out yesterday, but I wasn’t one hundred percent happy with the printable, so I thought I would give it a day. Thanks to a hiccup in our internet the Printable of the Month page didn’t go private like it was supposed to, and I woke up this morning to a flood of requests in my inbox, so I guess you all like the printable as is? I’m super excited about this month’s printable. 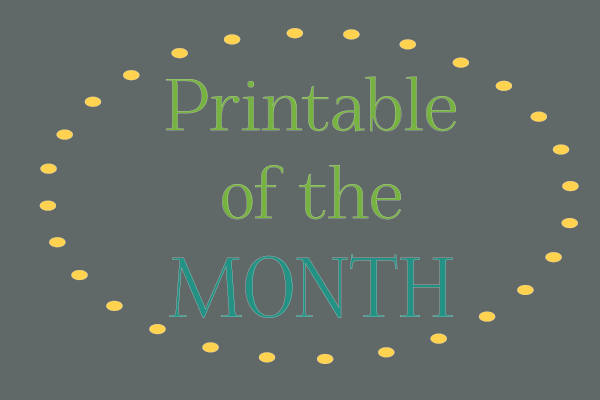 The idea for it came from one you, so that makes this a printable of the month and a reader request all in one, how amazingly awesome is that? Before I get to the printable though, I wanted to take a moment to address a few questions/concerns that I’ve been receiving just so there is no confusion. First up…. NO! Absolutely not! If I ever decide to create a mailing list, it will be an opt in thing, not hidden in a feature on the blog. The only reason I need an email address from you is so that I can send you your printable. I don’t save your email addresses in any way. And that is why you don’t receive an email telling you about the new printable. The next thing I want to talk about is sort of tied with the one above. Just like your email addresses, I don’t save any info on the form. The only reason there are areas that are “required’ when you fill out the forms is to make sure I have all the info I need to make your printable for you, and also to deter spammers. One month I didn’t put in as many required fields and I received soooo many spam requests that I could hardly keep up with the emails coming in. However, as one of you pointed out last month, you don’t always feel comfortable sharing info like that. And I’m truly sorry that I didn’t think of that before. So, from this month on, each printable of the month will have a non-personalized version that you can download straight from the blog, no forms to fill out. That way you don’t have to feel like you’re missing out if you don’t want to fill out the form. I hope this helps clear up a little of the confusion. And if you have any further questions, please don’t hesitate to send me an email, or leave a comment, I love hearing from you! As I mentioned above, this month’s printable started with a request. A wonderful, kind-hearted reader sent me an email and in it she mentioned that she had found a printable on another site (Smead Orgonomics: What To Do Now vs Later) and then she found another similar idea on another site (Simplify 101: Finish it Friday) but while she liked certain things about each, neither one was quite what she was looking for. While chatting back and forth through emails I came to the realization that this would make a great printable of the month. It’s perfect for those who don’t want to use a weekly planner or who prefer to not fill their planners with all their to do’s. It’s also great to use with a planner, because you can prioritize your list and plan accordingly. The my top 3 section at the top is a tool I’ve been using for a long time now, and you can read more about that over on System Savvy Consulting where I guest posted about how I deal with being overwhelmed. The basic idea is to pick the top three, most important or crucial things you need to do in the week, and put them at the top. That way, if life happens and things get crazy you can stay on top of the crucial tasks, and reschedule everything else. The main to do list area is broken up into three sections, “I must complete”, “I really should” and “if I have time” which is just a way to think about how you prioritize your tasks, and can help with scheduling them in. There is an area for reminders for the week, and a space for errands and communications, as well as a place to jot down anything that comes up that needs to be dealt with the following week. 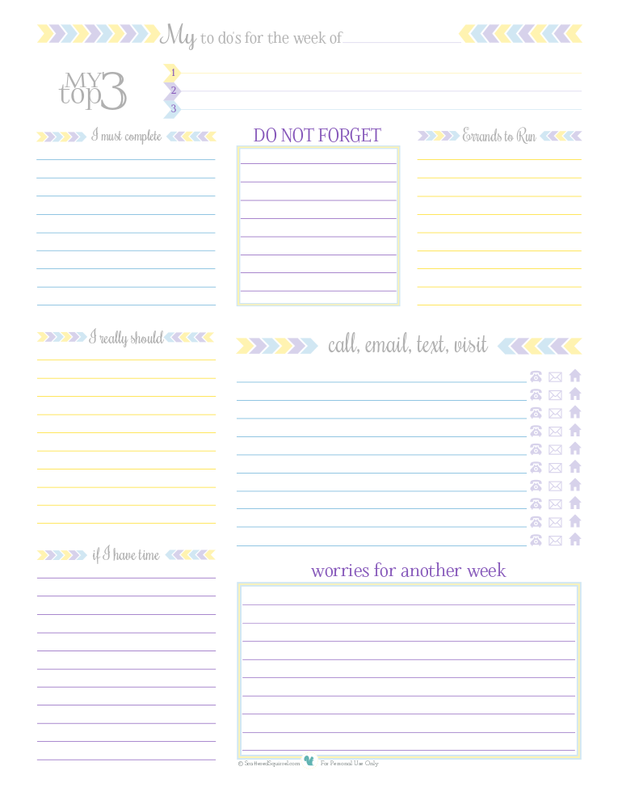 It’s a bunch of to do lists all in one place! For those of you don’t want it personalized you can click on the picture below to get your copy! And for those of you who would like it personalized, please fill out the form below. There are really so many ways to use this printable, I’m thrilled that it was requested. (I’ve only been using mine for a day and already I feel like I’m a little more in control over what’s happening this week. (even though it’s halfway over 🙂 ) A huge thank you goes out to the reader who requested this, and was ok with me sharing it as the printable of the month, it is a fantastic idea. Thank you for letting me share it. What do you think? Do you like to keep your to do lists all in one place? I started out spending several hours on your site that has now turned into days… Needless to say, you have so many GREAT printables and articles there is no way to finish it all quickly. I do have to say I found myself disappointed tonight… I LOVE this printable and was even happier when it said I could personalize it by filling out the form below, yet there isn’t a form… Please let me know if I over looked a link or something! Thank you for all of your hard work and great content!! First, thank you so much for such a nice comment. I’m thrilled that you found me, and I will have to hop on over to The Frugal Crafter and thank her. I’m happy to hear you’re finding some printables that will be useful for you. I am so sorry about the form not being there. I do have a statement at the top of the post that mentions the offer is no longer available, but I’ll have to go in and update that post better so it’s more clear. That was from when I was doing a feature called Printable of the Month, which I no longer offer. It became a lot of work, which I loved doing, but it was taking a lot of time away from blogging and sleep time, though I’m hoping to bring it back in a more manageable way in the future. Head on over to my contact page and shoot me an email, I’ll see what I can do for you. Aside from this, I hope your experience on my site has been a postive one.